"The calling of God ought to be preferred without any question, before all duties that we owe to men." "It is easy for us to say, Come, see our zeal for the Lord! and to think we are very faithful in his cause, when we are seeking our own objects, and even doing harm instead of good to others." "Suffer me first to bid them farewell that are in my house - As Elisha did after Elijah had called him from the plough, 1Kings 19:19 ; to which our Lord's answer seems to allude." "As ploughing requires an eye intent on the furrow to be made, and is marred the instant one turns about, so will they come short of salvation who prosecute the work of God with a distracted attention, a divided heart. Though the reference seems chiefly to ministers, the application is general." "The plowman must look ahead instead of back. So, too, of the Christian. The Savior's words were suggested by a request of one to go home for a farewell before following him. In thousands of instances it has been shown that the convert who goes to confer with unbelieving relatives before the final step is likely to part with Christ instead. Heathen, ready to be baptized, who go home for a final farewell before the step, are likely to be persuaded not to take it, so missionaries tell us." Commentary, Luke 9:51-62, Mikeal C. Parsons, Preaching This Week, WorkingPreacher.org, 2016. "The Lukan travel narrative (chapters 9-19) begins with a notice of Jesus' resolve to go to Jerusalem and his inhospitable reception by a Samaritan village." "When in your life have you found yourself making precisely this choice? For you is it a question you struggle with often, even every day?" "I'm thinking that if I were to preach from this passage, I wouldn't be preaching to the congregation so much as simply allowing them to eavesdrop on a message I would be preaching to myself." "Let the Dead Bury Their Dead," Mashaun D. Simon, Modern Metanoia, 2016. "The most important thing we can do is set our face to Jerusalem, and all the pain that may bring us. This discipline saves and heals us." "In what increments will you measure your life? Your ministry? Because every moment counts, says Jesus. You count. You matter. And God counts on you." "Following Jesus?" Alan Brehm, The Waking Dreamer. "The kind of sacrifice following Jesus demands means that the Kingdom of God takes priority over everything else. It means working for compassion, justice, peace, and freedom simply because it's the right thing to do. It means giving yourself away in service to others without looking for a reward." Commentary, Luke 9:51-62, Michael Rogness, Preaching This Week, WorkingPreacher.org, 2013. "Whether we think of ourselves as aliens, strangers, nomads, or pilgrims on this earth, it is because we follow Jesus, and that often takes us into new ways of living!" "So what if the deepest calling of a Christian disciples isn't to be in control – ourselves or vicariously through God – but rather to give up the illusion, to take some risks, and to throw ourselves into this turbulent life and world God loves so much trusting that God will join us in the adventure, hold onto us through all the ups and downs, and brings us in time to the other side." "I would love to be an ecclesial entrepreneur and I have deep respect for those who are creating new expressions, but that's not where Jesus is going in front of me, I'm staying close right into the troubled institutions of church until staying close leads me out. In or out doesn't matter, staying or going, organized or not, dogma or the floating currents of the latest of radical theology–it doesn't matter. What matters is staying close, watching Jesus up ahead, and running my hardest to keep up." "Jesus' reaction is a rather capacious, 'Whoever is not against us is for us.' Here, it seems that following is a much more difficult matter." "Keep your hand on the plow. Do not grow weary in doing what is right. Hold fast to the confession of your faith without wavering. Why? And, more importantly, how?" "Midsummer Wisdom," Nancy Rockwell, The Bite in the Apple, 2013. "Instead of anger, Jesus gives us three sweet, short wisdom sayings, sayings for hard times, sayings that reflect his sorrow, sorrow that the time sweet and full times are over and time itself is growing short now. Sorrow that what lies ahead will be difficult, and he must set his face into the cold wind of it." "I'm convinced that this is really the only good reason we make church: it's because we want a home. We want that dwelling place, a safe place to engage the questions of our day and the daily decisions of our lives. We want a place of refreshment but not retreat, a place that calls us to be all that God created us to be, even as we learn that God loves us just the way we are right now." "God certainly desires our devotion, love, and thanks. But, when we trade those in for a crusade…we can all too often end up looking like James and John." "Jesus the Jerk," Russell Rathbun, The Hardest Question, 2013. Holy Textures, Understanding the Bible in its own time and in ours, Luke 9:51-62, David Ewart, 2010. "What do you think Jesus means when he says the dead should bury their own dead? How have you experienced this to be true in your life?" Evangelio, Comentario del San Lucas 9:51-62, Lisandro Oriov, 2013. Commentary, Luke 9:51-62, Marilyn Salmon, Preaching This Week, WorkingPreacher.org, 2010. "But in this lectionary year, Jesus' journey to Jerusalem is placed near the beginning of Ordinary Time, or Pentecost Season, in which the focus is on the Christian life." "First Thoughts on Year C Gospel Passages in the Lectionary," Pentecost +6, William Loader, Murdoch University, Uniting Church in Australia. "Churches have often reinforced the values which have prevented people from growing up. It is not just a therapeutic issue for individuals - and that alone is worth a sermon about liberating grace and some exorcism. It is also what it does to our community and our world when local family values, systems and loyalties, even local racial and national loyalties, lead us to betray other people, usually those much worse off than ourselves." Exegetical Notes by Brian Stoffregen CrossMarks Christian Resources. "We can neither wallow in our past sins nor boast of our past successes if we are to be fit for the kingdom of God." "In God's kingdom, we are not defined by our past, however, but by our future." A Samaritan Village Refuses to Receive Jesus, audio telling, story in episodes, graphic, audio and written commentaries. Go Tell Communications, Biblical Storytelling for the Global Village, 2010. First Look: Luke 9:51-62, Lee Koontz, Reflectious, 2010. "The fact is that for those who would follow Jesus, nothing must get in the way. Following Jesus required the ultimate sacrifice and the ultimate commitment." "Jesus instructs a man to abandon his family. This is serious stuff, and it deserves to be taken up from the pulpit in parishes -- most especially in this age in which being a 'Christian' is supposedly synonymous with 'family values' that are identical with those held by respectable people in our culture." "Jesus and the Samaritans," Gospel Analysis, Sermons from Seattle, Pastor Edward F. Markquart, Grace Lutheran Church, Seattle, Washington. Detailed background and exegesis. "This past week I read an absolutely wonderful quotation from Dr. George Caird. He is my favorite author on the book of Luke, and he gave me this wonderful quotation: 'The most difficult choices in life are not primarily between good and evil, but the most difficult choices in life are between what is good and what is best.'" "The Call of Jesus," Rev. Bryan Findlayson, Lectionary Bible Studies and Sermons, Pumpkin Cottage Ministry Resources. Includes detailed textual notes. Kairos CoMotion Lectionary Discussion, Luke 9:51-62, "A place of conversation regarding Progressive Christianity." "It is so easy to take the flame of self-righteousness (always, of course, disguised as well-meaning for another) and to advocate for utter destruction of those who don't see what we see and respond as we respond." "The Role and Commitment of the Disciple," Larry Broding's Word-Sunday.Com: A Catholic Resource for This Sunday's Gospel. Adult Study, Children's Story, Family Activity, Support Materials. "Whom do you admire as a Christian? Why?" Allison, Dale C., Jr., "Rejecting Violent Judgment: Luke 9:52-56 and Its Relatives," Journal of Biblical Literature, 2002. Conn, Harvie M., "Lucan Perspectives and the City," Missiology, 1985. Evans, Craig A., "Luke's Use of the Elijah/Elisha Narratives and the Ethic of Election," Journal of Biblical Literature, 1987. Fletcher-Louis, Crispin H.T., "'Leave the Dead to Bury their own Dead': Q9.60 and the Redefinition of the People of God," Journal for the Study of the New Testament, 2003. Brockmuehl, Markus, "'Leave the Dead to Bury their own Dead': A Brief Clarification in Reply to Crispin H.T. Fletcher-Louis," Journal for the Study of the New Testament, 2003. Hawkins, Peter S., "Still Small Voice," The Christian Century, 2001. Nuechterlein, Paul J., "The Work of René Girard as a New Key to Biblical Hermeneutics," Currents in Theology and Mission, 1999. "Demon Possession and Why I Named My Depression 'Francis'," Nadia Bolz-Weber, Sarcastic Lutheran, 2013. "Radical Commitment," Pentecost +5, 1 July 2007, Hubert Beck, Goettinger Predigten: Every Sunday Sermons based on the RCL by a team of Lutheran theologians/ pastors. "Jesus and Rejection," the Rev. Dr. Kenneth L. Samuel, Day 1, 2005. "The Fourth Sunday after Pentecost," 27 June 2004, Walter W. Harms, Goettinger Predigten: Every Sunday Sermons based on the RCL by a team of Lutheran theologians/ pastors. "The Color Purple," the Rev. Mark Sargent, Day 1, 2004. "Three Sermons For The Price Of One," Pastor Edward F. Markquart, Grace Lutheran Church, Seattle, Washington. "Hide and Seek," the Rev. Rosemary Brown, Day 1, 2001. "When the Going Gets Rough," Charles Kirkpatrick, Sermons4kids.com. "Making Excuses," children's sermon, coloring page. Charles Kirkpatrick, Sermons 4 Kids. "Jesus Asks His Followers to Leave Everything Behind," Sunday School Lessons: Family Bible Study, art projects, music, stories, etc. 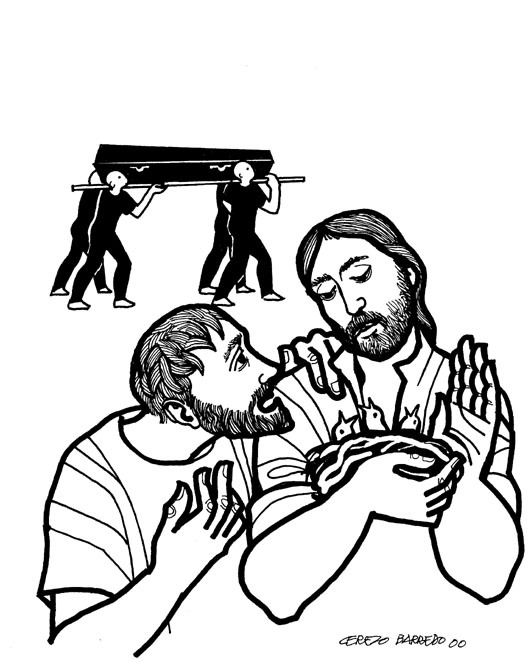 Luke 9:51-62 at Cerezo Barredo's weekly gospel illustration. Liberation emphasis. Hymns with Scripture Allusions: Luke 9:58. The Cyber Hymnal.